What is Targeted Job Search? What is the difference between a job search and a ‘targeted’ job search? This must be the question puzzling your mind, especially if you are reading about it for the very first time. But don’t worry! 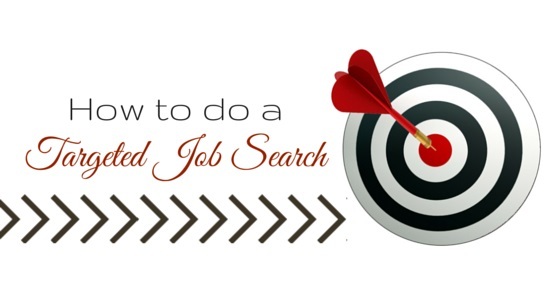 As in this article, you will not only learn about actual meaning of the targeted job search, but you will also comprehend its importance, the perfect time to begin it, and effective ways to conduct a benefiting targeted job search. A job search program is you hunt for a job that offers you to do task that you are comfortable doing. And in return to this, it offers you a fixed sum of money. To be more specific, you are open to do something that interests you and pays you fairly good monetary sum in exchange. But as an active job seeker, it must not be sufficient for you, and that is what targeted job search is all about. With a ‘targeted’ job search program you should look for an employment opportunity that best compliments your skills, values, goals, and interests. Developing an adequate targeted job search module can help you land to a job that is not only rewarding but can provide you with long-term job satisfaction. The methods employed in the targeted job search process are excellent networking and direct employer contact. Now that you have learned about targeted job search program, so now it’s time to explore its importance in your career. Since you have entered the job through your networking skills; you therefore lie on the ‘front end’ of the opportunity curve. It is almost impossible that you will get the chance to a job description according to your will. The better choice than this is to get hired to a job that maximum meets your criteria. By bringing you to the front of an employment opportunity you can avoid competing with numerous other applicants. The job never enters the market it is only you who have to become the market and grab the chance. If you are able to find a suitable job for yourself, then it is not only benefitting only you. Even the employer is benefitted to great extent as it saves a lot of time and money to him. They don’t have to advertise on the job, don’t have to put in recruitment efforts, and even don’t have to invest much time. As compared to conventional passive methods of job search, adopting this technique of finding a job can actually make you secure more number of jobs that precisely fit into your criteria. With a targeted job search process; you have the sole right to make a firm decision about the company and position for which you wish to work. It gives you the chance to closely monitor each and every element of a job position, before you actually start working on it. The foremost criteria that you should consider while preparing your targeted job search plan is the type of position at which you wish to work. It can include your grade, technical expertise, subject related interest, or your professional work background. For instance, if you are in teaching industry, then first you should decide for the class you want to teach, and also the subjects you are interested in teaching. Employers type may refer to type of organization, industry, or firm in which you are interested to work. If you desire to work and expertise in a specific industry, then you can look for jobs matching your skills in it. If you are a fresher, then experience here don’t really matters. You can then look for a job that is particularly a best fit to your skills. Identify your strengths, proficiencies, and tasks related to your past experience and then search for a job that is within your preferred industry and that can best value your strengths and capabilities. Whether you wish to be a part of the corporate culture, or you love working in field, or you are comfortable working in the back-end department, the choice is absolutely yours. But be specific in this regard while you look for a job, as it will only help you land to your dream job, or maybe to the next best step of your career. Moreover, it will also aid recruiters to find a much appropriate job for you. This is an obvious parameter! If you are planning for a targeted job search process, then surely you must want to get hired to a job that is rewarding from all aspects. So, consider searching for an employment opportunity that can help your career to advance to great heights. When searching for a job, most employers prefer willingness to relocate anywhere. It is better that you mention few specific locations that are of your personal interest. It will allow you to manage your search process and enable you to incorporate more focused element to the search process. In case you wish then you can also consider other vital parameters such as benefits, salary, development opportunities, and more. Selecting such parameters will narrow your search targets and might also reduce the employment opportunities; however, it will focus only on jobs that exactly match your preferences and requirements. Although, there is no specific time to start a targeted job search process. But still, there are few instances that you can consider to make sure that your targeted job search program is able to get you hired to your dream job. Intensive research and excellent networking are extremely vital to land to a great job opportunity through targeted job search process. So, once you are confirmed that you have researched well for the companies in which you wish to work, and have even found few networks within them, then it’s perfect time to begin the search process. When you are in need of a job, then you are under immense stress and pressure. This can make you land to a job that you actually didn’t desired. It is therefore wise that you begin hunting for a new job and start your targeted job search process 3 to 4 months before you really need it. This way you can look for new opportunities and decide on one if you find it suitable. If it does not suit you, then look for more other chances. The targeted job search process is concerned with direct employer contact or networking. So, if you have found that your dream organization is opened up with new vacancies, then it is time that you begin your targeted job search process and look for a position that best meets your criteria. If problems have start emerging with your current job, then it is a sign that you should begin your targeted job search process immediately. Increasing troubles within your current job will boost stress and unhappiness. It is therefore required that you start looking for a novel option as soon as you discover issues within your present job. If you are facing unemployment since long time and you are not able to find a perfect matching job for yourself, then you should begin a targeted job search process in order to find a respectable job based on your parameters. Most individuals are in reality not clear of what they actually want from their lives, specifically when it comes to job search. You must be ready to do anything that can bring you more income and that partially meets your requirements. But it is important, that you consider your needs, education, passions, backgrounds, and interests. By having a deep understanding of such aspects you can plan a job search process that is more targeted and focused. So, make sure you create a career path that you wish to follow, and then you prepare the job search module in its context. Don’t apply for just any job, rather try to be specific. Make sure that your resume is customized and targets each job in particular that suits you. You can look for themes and keywords and include them in your resume to highlight your skills and qualifications that are required for your targeted job. No matter what happens, don’t skip the research part! Companies wish to hire individuals who possess deep knowledge about them. Moreover, if you are aware of company’s requirements and job responsibilities, then you can customize your resume accordingly. It will also help you to act proactively during the interview session. It is very much essential to know your skills and qualifications, if you want your targeted job search process to be effective. Before you hit the market, it is required that you yourself become aware of your inner strengths. Make sure you check that your inner strengths are in compliance with the job requirements of your desired organization. With more number of jobs being advertised online and spread through professional networking, it is essential that you secure a well-established network. Not only networking will help you connect to other professionals of your industry, but will also provide you with novel employment opportunities which you otherwise would not have found. If possible then try to make a direct contact with at least one employer of the organization in which you prefer working. If you have used your networking skills wisely, then the job search process can actually get you hired to a job that you have always wanted. Since this job hunting process is completely based on parameters outlined for your career goals, so it can offer you with an employment chance that can be really rewarding and beneficiary for your career. Last but not the least, if the job search process is organized and followed efficiently, then it can offer you with an excellent job opening that can be simply rewarding for your long-term career. So, as a result it might bring an end to your long lasting unemployment . Concentrating your time and efforts on a targeted job search is essential. Understanding what you want to do, generating personalized documents, conducting research, understanding your potentials, and expanding your professional network are top ways to focus your energy and target jobs that are ideal for you. Previous articleJob Networking – How Networking helps to Find Employment?